Guadalupe Amador Sanchez, age 88 of San Antonio, went to be with the Lord on January 28, 2018 after a long courageous fight against continued health issues. She was born on February 27, 1929 in Seguin, Texas to Eustaquio and Guadalupe Robles Amador. Lupe is preceded in death by her parents, husband, Louis Sanchez, and her sister, Lina Amador. She is survived by her sister, Angela Salazar; nieces and nephews: Lupe Rios, Frances Rios, Frank Rios, Janie Gonzales, Josephine Charles, Raymond Amador, Margaret Ann Lockamy, Johnny Rodriguez, Abel Salazar, and Mary Ann Venable; step-sisters and step-brothers: Isabel Noriega, J.P. Amador, Beatrice Cuellar, Dolores Ramirez, Betty Ann Hannuksela, and Eustaquio Amador; and numerous great nieces, great nephews, and other family and friends. Although not having children of her own, she treated her nieces and nephews as her own. 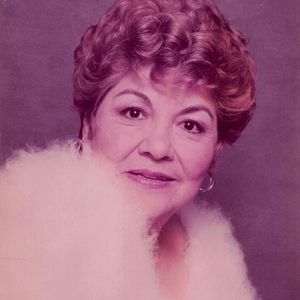 Lupe was a Beautician for many years, and in her spare time she loved playing golf. She and her husband were very involved in the Pan American Golf Association for many years. She enjoyed spending time with her friends and family. She had a great sense of humor and enjoyed telling jokes, she always knew how to put a smile on your face. She was a great lover of animals. She will be deeply missed. Visitation will be held on Monday, February 5, 2018 from 5:00pm to 9:00pm at Porter Loring Mortuary on McCullough Ave.
Interment will follow at San Fernando II Cemetery. Add your thoughts, prayers or a condolence to Guadalupe's guestbook.